This recipe is perfectly elegant in the way I like best: few ingredients, magical transformations. Whole buckwheat groats, salt, and water ferment with ambient organisms to become a toothsome, nutty, wholly bready bread. Well over two years ago, Sandor Katz tweeted a link to this recipe by Conscious Catering. As far as I can tell, the Conscious Catering folks were the first to take the wild fermentation method used in making dosas and idli, and adapt it to buckwheat in a loaf shape. 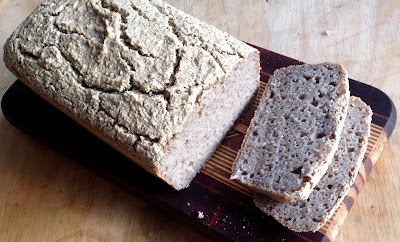 I've been baking it nonstop ever since, and it's gotten a bit famous among fermentation enthusiasts and wheat-avoiders. 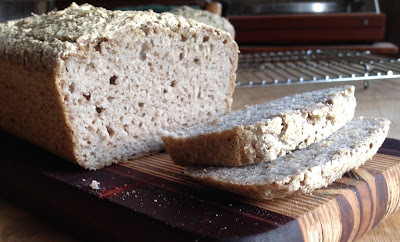 I have used non-sourdough wild-leavened bread recipes in the past, and found them to give me inconsistent results. 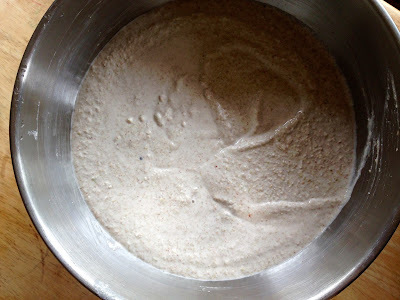 They often amount to creating a new sourdough starter at the same time as making the bread, which is a bit of a gamble, and can leave you with barely-leavened bricks for bread. Usually, I'd much rather have enough time to build up a powerful starter before trying to make bread out of it. So I would have foolishly ignored this recipe, except for knowing that dosas and idli do work. The crucial part of the dosa method is that you soak whole grains, rather than starting with a flour-based dough. 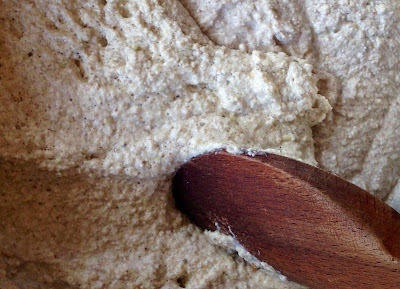 I've found that wild-fermented dough made of ground-up soaked whole grains is much more bubbly and active than a flour-based dough of the exact same age. The grains begin to sprout during the long soak, which unlocks the stored starches and makes them into more yeast-friendly sugars. I did find that the recipe needed some adjustment, particularly during the colder months. Merely extended the dough's fermentation time (as the original recipe suggests) can give you some very fishy-smelling dough. Rather, I extend the soaking phase substantially. Soak five cups of whole, raw buckwheat groats in a large bowl of spring or filtered water for 8-12 hours. Rinse and drain the buckwheat groats (the water becomes quite thick). Add 2 teaspoons of salt and 2 cups of water. Puree with an immersion blender until a smooth batter forms. You can also mash them (minus the water) in a large mortar and pestle. Cover the bowl with a tea towel and let the batter ferment until it's bubbly and swollen--it may reach 1.25-1.5 times its starting volume, but after that it won't improve. In the summer, this takes another 12 hours or so, but in the winter, it may be more than 24 hours. If it doesn't look risen at all, give it a stir every 12 hours to keep the surface from getting funky. Very gently, give the finished batter a brief stirring. It will have some larger, loose bubbles, as well as very fine bubbles like beaten egg white. 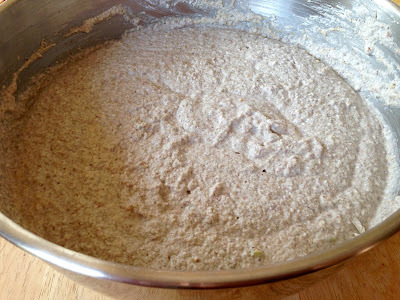 Scoop the batter into two well-buttered bread pans and bake at 400 degrees for 15 minutes (no need to rise in the pan). Turn the oven down and bake for 45 minutes more at 350. Let cool for 10 minutes or so before gently removing from pans. Cool on a rack, covered with a tea towel. This bread is at its most convincing when fresh from the oven. It doesn't age very well. I keep one loaf out at room temperature, covered with a tea towel, and it doesn't dry out to too much in the few days it takes me to finish it. The second loaf I store in a plastic bag in the fridge and only eat toasted. Once it's stored in plastic, the crust softens in an unappealing way and is prone to mold growth. I just made this and the dough smells a bit funny. Is this normal? Wild-fermented doughs can definitely smell funny. I find this especially true at colder temperatures when the batter takes a while to rise. Thanks a lot for posting. This recipe is great. Following your adviced , I never got that fishy smell and flavour any more. You dont say it but I decided to preheat my oven for 10 minutes as in other bread recipe; dont you find it necessary? If so, I will skip it. Last batch I made ,put 1teaspon of coconut sugar in order to get more bubles which I got but I wonder if that will cause gut trouble or any problem after months of use. Thanks again.